The Blot Says...: Dan McCarthy’s MondoCon 2017 Exclusive Prints! Dan McCarthy’s MondoCon 2017 Exclusive Prints! 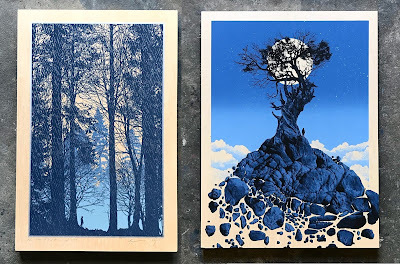 Dan McCarthy is bringing his incredibly beautiful artwork to MondoCon 4 this weekend (November 4-5) in Austin, Texas, and you absolutely have to see it to believe it. Just check out the MondoCon exclusive variant of “All was right with the world”! Limited to just 12 pieces, it’s an 18”x24” signed and numbered 6 color print on wood. Then there’s the MondoCon debut of “The rain had a sound”, which is an 12”x18”x1.5” signed and numbered 3 color screen print on wood. This bad boy is limited to 176 pieces and will look fantastic on anyone’s wall!